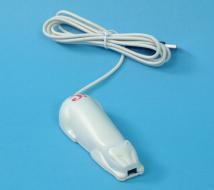 What I am selling are cases of 100 each new unused un-modified oem packaged USB CueCat Barcode Wands / Scanners. So, What is a CueCat?? Long live the hackers, these people found that with a few minor modifications the CueCat could be made to work as a standard bar code reader. Free software was written for the Windows, Linux, Unix, MAC and other OS's which helps to tame the CueCat and undo the stealthy reason behind Digital Convergences business plan. Small Business's for POS, where else can you do this on a shoe string budget??? For Windows 2000 and above users, once modified you just plug it into your PC and you're ready to, it uses standard Windows drivers. You can scan into your Databases, Spread Sheets, Word Processors etc... For further info goto this link on the CueCat. Sale Price: $475.00 You Save: $25.00 (5%)! Sale Price: $462.50 You Save: $37.50 (7.50%)! Sale Price: $450.00 You Save: $50.00 (10%)!